Place your mobile phone on the pad and wait for the charging notification to appear. Branding to the pad will ensure your business is clearly visible on a daily basis, securing regular attention to your brand. Wireless charging compatible with Android latest generations, iPhone 8, 8S and X. Input: 5V/2A. Wireless Output: Output: 9V/1.1 10W. The branded charging pad supports 10W charging to charge your phone twice as fast as most wireless chargers on the market. The soft top material makes a great cushion for your mobile as well as having that all important grip. Branding can be applied to the side to ensure your brand stands out. For an added extra, you can apply a customisable sleeve and gift wrap, making it a great gift for customers or employees. This foldable charging stand for Qi compatible devices with 3-Coils design and large charging area is the ultimate desk item. It charges your phone in horizontal and vertical position, making it a nice alternative to the flat style pad. It has a LED indicator for the charging status and keeps your logo in constant view. Flat and durable Powerbank with 8.000 mAh lithium polymer battery. 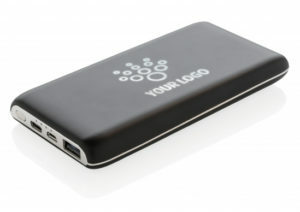 The wireless ABS Powerbank has the option for an engraved logo on the front panel. When using the Powerbank the logo will light up, enabling your brand to shine. It has strong suction pads making it a perfect fit for your mobile device. As well as the wireless charger, you can also use a regular USB port or the type C port to charge your mobile device if needed. For those that still love a Mousemat, this is a really cool gift! Simply place your mobile on the PU pad to charge all mobile devices that support wireless charging. The Mousemat is a great way to get your brand seen on a daily basis, giving a new lease of life to such an 'old' desk favourite! Android latest generations, iPhone 8, 8S and X. If you would like to discuss any of our trendy tech items above and how they could benefit your business, get in touch to see how we can help. Call 01623 636602 or contact us via email or LiveChat via our website. As we're back into our daily routines from the seasonal break, we take a look at some trending products for 2019. As you would expect, technology is still at the forefront. 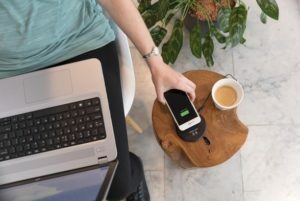 Wireless charging, fast charging for personal devices and Bluetooth technologies are in demand and geared towards keeping us connected! If you're not familiar with Wireless Charging then in short, it's a technique to charge mobile devices through induction. 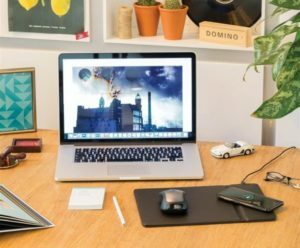 Other benefits include, quicker charging and helps to reduce the amount of cables in your work space, as well as less cables to remember when you are on-the-go! Making it easy and efficient.